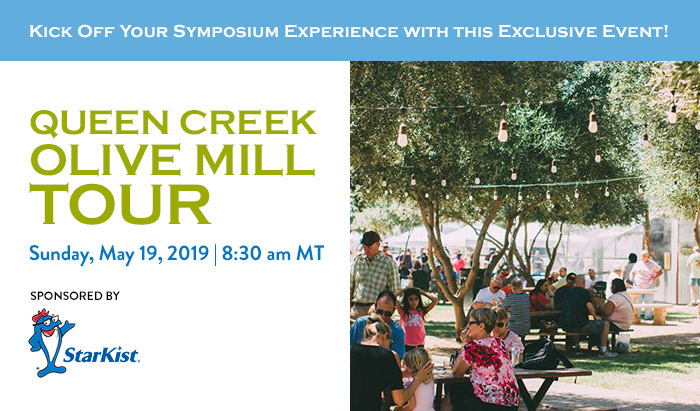 Join us for a delicious morning tour of the award-winning Queen Creek Olive Mill. We will take a bus to the family owned and operated groves and mill bright and early Sunday morning. Bus departs the hotel at 8:30 am. Spaces are limited. We will meet Queen Creek’s owner and Olive Oil Master Blender and Sommelier, Perry Rea, who will take us on a culinary journey. We will learn the history of his family, their sustainable farming practices and the milling process. We will learn the art of tasting olive oil and discover the unique profiles of each. We will discover how to cook, bake, drizzle and fry with Extra Virgin Olive Oil. Following the tour we will enjoy a delicious lunch prepared especially for us by the Queen Creek chefs overlooking the olive groves. Before heading back you’ll have time to shop in the gift shop and explore the grounds. The bus will depart at 12:15 pm and have you back in time for a quick break before the Sunday afternoon session begins. with the Commission on Dietetic Registration (CDR).